Tap into the trend for heritage-inspired jewellery with this beautiful halo design. Incorporating a single large Danube-cut cubic zirconia encircled by sparkling stone accents, this lavish rose-coloured ring is a modern take on vintage style and perfect for any occasion. PANDORA Rose is composed of a unique blend of metals and is available online or in concept stores. PANDORA Rose Timeless Elegance Ring is rated 4.6 out of 5 by 278. Rated 5 out of 5 by lyss17 from Amazing! my boyfriend got this for me as a promise ring before we left for college in august and I absolutely fell in love with it! It got damaged about a month ago and my heart was broken. Pandora was amazing in sending me a new ring and I wear it everyday! the ring is just as beautiful and shiny in person as it is on the website! Rated 5 out of 5 by Hayc0 from Don't question it! Sparkles like genuine diamond. My boyfriend got me this ring for my birthday and I couldn't be happier. It's gorgeous and I'm in love. Could've been an engagement ring from what I see. It sparkles beautifully! Don't question getting this for your future wife or girlfriend. 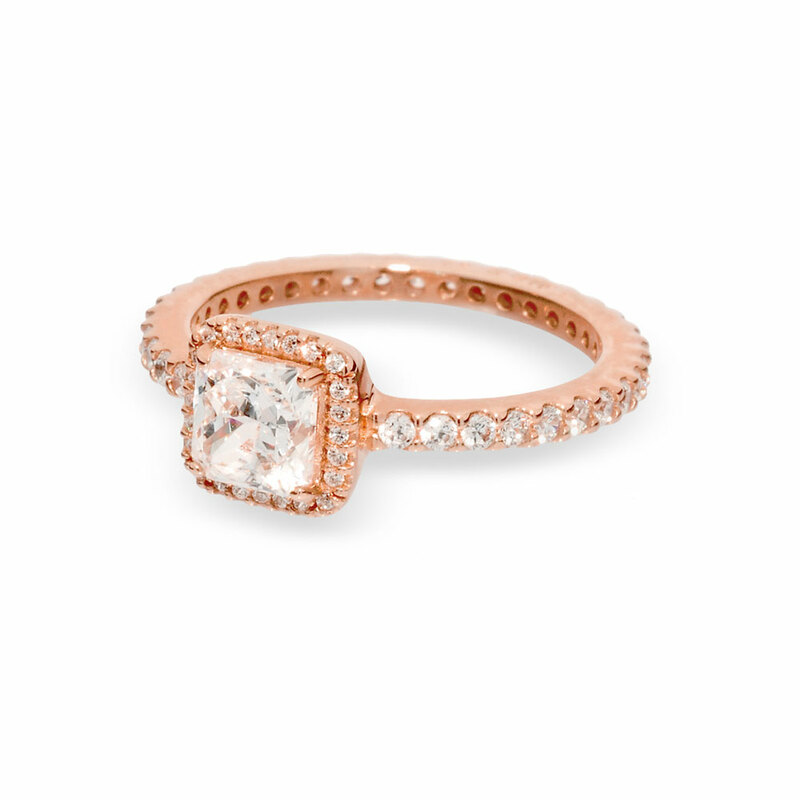 If you love lots of sparkle and dainty jewelry without the gaudy look, this is the ring. I'm obsessed! Rated 5 out of 5 by Kendra5212 from Gorgeous My boyfriend got me this almost a year ago as a birthday present. It is GORGEOUS, but I have lost 4 stones out of it. I called pandora and they're fixing it for me! Nicest people, beautiful products. Rated 5 out of 5 by BrittanyOb from Absolutely stunning! My fiancé bought this for me as an engagement ring. It is absolutely beautiful! I have seen bit more expensive rings but nothing looks like this. It’s much shinnier in person. I really love it. I am so happy. Rated 5 out of 5 by NatalieES from Love this ring! This ring is more beautiful in person than on the website! Absolutely thrilled that I bought it. Rated 5 out of 5 by Kait Sherwood from Beautiful Ring! My boyfriend surprised me with this ring for my birthday.. Absolutely beautiful! I wear it almost every day. Had it for a year now, and it's still just as beautiful as the day he surprised me with it. Really goregous! !